Families, especially the kids, will just love the award winning Vikingar! This exciting, "real-life" viking experience is a must and has prime location in the beautiful coastal town of Largs with stunning views over the the Isle of Cumbrae and beyond. Let our Viking Storytellers guide you through through everyday life in a Viking homestead, explore the culture and folklore of these warrior peoples and their historic significance to Largs and the West of Scotland. There are also interactive exhibits and an atmospheric multimedia presentation on this fascinating period of Scottish history and of course, the Battle of Largs. Vikingar! - not to be missed! 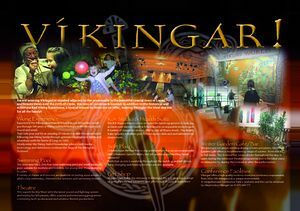 In addition to the visitor attraction, leisure facilities are also available at Vikingar! including swimming pool, fitness studio (gym), the famous Barrfields Theatre and soft play area. 30 minutes from Glasgow and 60 minutes from Ayr. Largs is signposted on the A737 at Lochwinnoch travelling from Glasgow and on the A78 from Greenock; Vikingar is also signposted from the A78 and A760. Trains operate along the coast to and from Glasgow, and Ayr, to Largs train station, passing or stopping at many seaside locations along the way. Vikingar! is a leisurely 10 minute walk along the promenade from Largs train station.